Admission is: $10 per person (plus HST). Please note that this event is primarily outdoors with visitors walking throughout the historic site. The tour goes even in rain. Please NOTE: This is strictly a ghost tour and not a historic site tour. We are not planning on scaring you. We tell stories about unusual happenings associated with the historic site. We keep our Pumpkinferno & the Terror Zone for all the screams in the fall. "Call up the Spirits" Dinner and Ghost Tour package available $22.95 per person + tax. SUPER PASS HOLDERS, please have your pass with you, if you take advantage of this dinner package. Your cost is $17.95 + tax. Please call Captain Roberts' Table Restaurant direct, to reserve 705-549-0713. IF YOU HAVE PASSES, PLEASE LET US KNOW AT THE CHARTHOUSE IN ORDER TO BYPASS THE LINE. Thank you. Join us for this swashbucklin’ event! Be sure to know your pirate name and beware landlubbers as Discovery Harbour will be transformed into the Pirates Lair!! Walk the plank and join the pirate crew for great famly fun! Roving hornswaggler musicians, sink a ship with Cap't Tuna, visit the tattoo parlor, learn yer knots and swab the deck! Be on the lookout for the Navy and Pirate Skirmish, pirate crafts, pirate inflatables', petting zoo and so much more! Be sure to git here!! 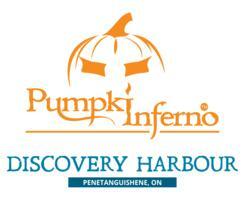 Shuttles available at Penetanguishene Town Dock (Main Street). RUNNING ALL DAY. This will be for King's Wharf Theatre goers as well. Catch the shuttle! Please USE your SUPER PASSES, Guest Pass, Pirates of the Bay and 'FUN' passes for this event. No discount coupons will be accepted for this event. VISA/MASTERCARDS/INTERAC/CASH accepted at the door. FREE admission for members of the Military and Veterans, family members at discount rate. Pre-Purchased, Advance tickets and Season Pass holders, please go to the front of the line and use the PASS window. 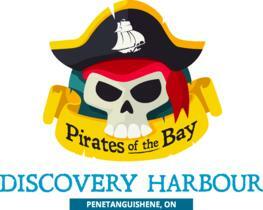 FREE SHUTTLES running on Friday and Saturday nights, starting at 6:30 PM, at the Penetanguishene Town Docks. Service animals ONLY permitted. NO family pets. For safety reasons, NO facial masks allowed.